Water filtration stations are located near common water fountains on campus. Photo by Ben Taylor. 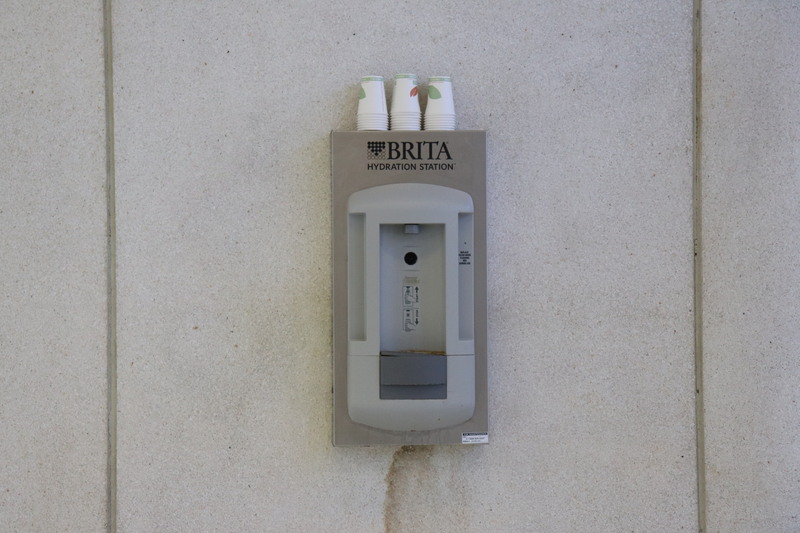 Water filtration stations are the rectangular boxes often seen above drinking fountains on campus. The stations are supposed to fill water bottles more conveniently than drinking fountains while also encouraging the use of reusable water bottles. Most stations feature a tracker that allows students to see how many plastic water bottles have been saved by refilling their water bottle. Each filtration station added to an existing water fountain on campus costs $2,000. Filtration stations added in a location without a water fountain can cost upward of $5,000 to $6,000. The last water filtration stations were approved for funding through the university capital budgeting process in June 2018. Following the approval of a handful of stations, additional funding was then added to build several more stations across campus bringing the total to nine new stations for the fall semester. “We see a trend of students of our generation are more concerned about sustainability than they ever have before,” said John Lacheta, SGA vice president of student initiatives and a senior management information systems and risk management double major. The idea to add water filtration stations was in part to student feedback both in person and through a survey asking students what they initiatives they want to see on campus. Despite costs, Kelly Helmer, a first-year digital media production major, said she felt the positive benefits of the filtration stations outweighed the costs. Nolan Ahearn, a first-year health sciences major, said he finds the filtration stations convenient and understands the positive impact they can have on the planet, but is not sure if they are entirely worth it. When the new Lacy School of Business opens next semester, the building will feature water filtration stations. Along with the business building, there is a possible opportunity to extend the station population by five new stations across campus in the near future through the university capital budgeting process.